Telecaster Comparison | Gear Acquisition Syndrome!! As Donna Summer put it, we “work hard for the money”. That’s why, when that extreme tidal wave of G.A.S. hits us square in the midcavern, we’ll go looking for the best value in the gear we have a hankerin’ for. In my Telecaster comparison today, we dispel the woodshed whispers and pull back the quality curtain on price point differences between the spotlight stars of retail and their lesser known, unassuming illegitimate cousins. Just like with Jack Bauer in the classic “24” series, hold on… ‘cuz this SHOOTOUT could get ugly!! So, we all want to make sure that the bucks we’re laying down for gear are worth the bang we end up plugging in, right? This is especially true when buying a big name brand instrument or piece of gear. We all know there’s a substantial mark-up in price for items that brandish that high-end brand logo on their headstock, front plate or audience-facing sides. This is true, no matter what kind of product it is: clothes, food, music gear… cars. 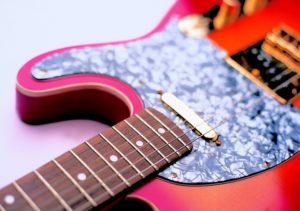 But the same components, same design and many times the same sound, with a lesser-known name on the headstock, can sometimes drop THOUSANDS of dollars in price. That much of a discount seems a little hard to justify, doesn’t it?? Well, maybe it is, maybe it’s not. If a brand name is well-known, you can also bet that there’ll be dozens, if not hundreds, of knock-offs (clone copies made by other companies) trying to produce the same tone, the same look, the same vibe for a lot less money. Most unlicensed knock-offs come from overseas, where the cost to produce the same instrument is much, much lower than here in America. Whether the reason is currency exchange rates, underpaid labor force, low black market component pricing, government financial underwriting, or a combination of all of these is anyone’s guess. Which all leads us to the answer to this burning question: is a name brand pro audio product substantially better than an imported knock-off product?? Time to answer that question, comrades. It’s shootout time! The Fender company I’m sure you all know. They’ve been at this for decades and have long passed their first rodeo. The Telecaster they CREATED in 1951, and it is one of their flagship, breakthrough successes. They are still made and sought after today, though many of the telecasters currently being sold go all the way up to $9,000. And custom builds?? They can be even more expensive. This “Elite” Tele from them is marketed as a modern Tele that can also cover some vintage sounds, so it’s not your average Tele by any means. Austin guitars are distributed by St Louis Music Company as a “catalog brand” for them. 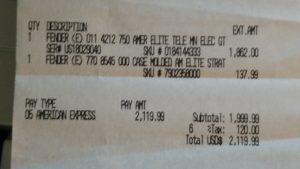 I did a review of my Austin Tele and how much I like it in THIS ARTICLE. Check it out if you want to know its history, intricacies and why I like it so much. I’ve used this guitar well and am very pleased with how it sounds and how it looks. But can it compare with my latest Fender Tele purchase?? Can’t Hear the Forest for the Trees? First let’s talk wood. The Elite Telecaster is made of Swamp Ash. The Austin Tele, out of Alder. These two woods are used by Fender all the time. 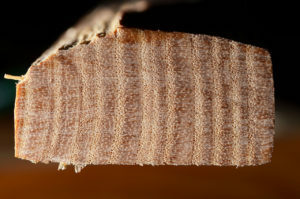 In fact, Red Alder is used by Fender waaaaaaay more than Ash, and many of their past Telecasters, including those around the time the Austin was made, were made of Alder instead of Ash. 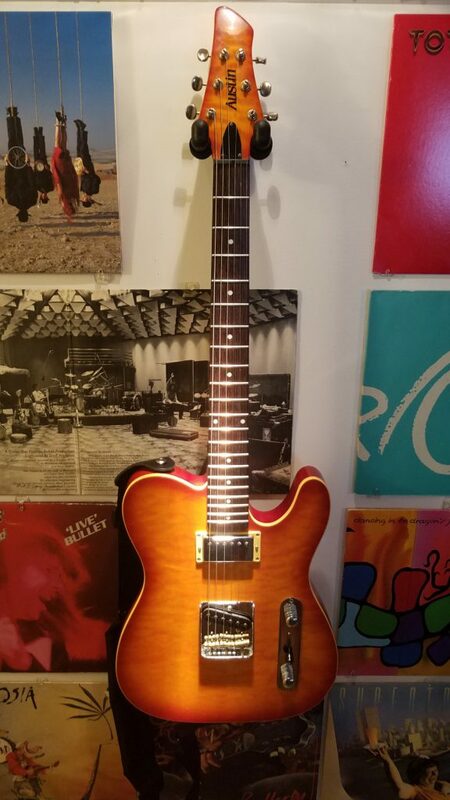 Specifically, since the Austin guitar is based off of a 1962 Telecaster, they chose Alder because that’s what Fender used that year for its Teles. Even in Fender’s reissues of the ’62 they use Alder, as seen HERE. 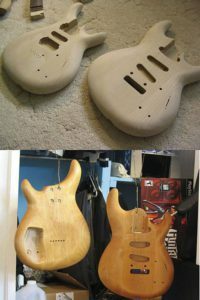 Fender does a great job helping us understand WHY and WHEN they use these two woods in THIS ARTICLE. I highly suggest you read it before listening to the recordings below. When it comes to guitars, wood is crucial in understanding tone. If you read that, then you’ll know that right away we should expect to hear a difference in the treble side of tone between these two instruments. The Swamp Ash in the Fender should sound more “chimey”, with more treble and less warmth than the Alder wood. The other wood-y fact we need to recognize is that the fingerboard on the new Fender is just the top of the Maple neck, as opposed to the Austin which has a Rosewood fingerboard. Fender Telecaster made completely out of Rosewood ! I much prefer Rosewood, personally. It’s not as slick and slippery as Maple, so when I shoot fast for notes and licks up and down the neck I don’t tend to over- or under-shoot with Rosewood. Plus it just feels better to me. The problem is, Rosewood is now banned world-wide. In 2017 a TON of new rules were dumped onto those wanting to use Rosewood to make things, because it’s been so over-used that it’s becoming scarce. The world over, Rosewood is used for many diverse artistic and utilitarian endeavors; the constructing of instruments is only one reason it’s been diminishing. For instrument-making companies these days, they just use something else. The market is simply too competitive currently to do otherwise, and with the HUGE rise in online shopping, and customers being immediately aware of what a fair and/or best price is at any second, the cost can’t be justified. This is why you’ll rarely see what was once so common – a Rosewood fingerboard on a guitar. Does it make a difference in tone? Probably not noticeably, but the feel is sure different. Amazing, isn’t it, how various woods can be so different from one another?! My purpose in today’s testing is the same: to simply find out how each guitar sounds, compare them, and see if there’s any truth to the notion that you don’t have to spend a lot of money to have a guitar that sounds really good. That’s all. Nothing else. I’ve got no axe to grind against either company. I’m not here to knock down “the big guy” to prop up “the little guy”. Nor am I setting out to somehow show that Asian imports are ridiculously pathetic or incomprehensibly subordinate (tho’ I don’t believe they are anymore). Rather, I simply want to compare two similarly-made, but much differently-priced guitars, and see how their tones sit next to each other. Now, obviously “tone” is a highly subjective subject. I’m not here to try to convince you of anything. Instead, I want to provide a window through which you can see, without having to spend ANY money, the true natures of these two guitars. 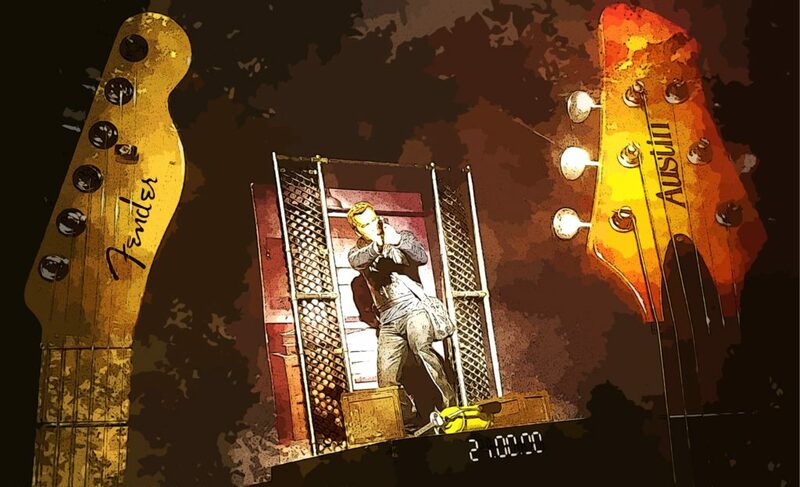 Why the Telecaster?? Because I have both an expensive and an inexpensive version of this iconic beauty, but I’m iffy as to whether I should keep the new Fender or not. It’s pretty pricey. Also, I figure the Telecaster is a very familiar guitar sound to industry players like us, well-known in the industry, respected and its sound can generally be picked out amidst many guitar tones. A secondary goal, for me, will be to see which guitar is the most versatile. I find, especially playing live, that I want a guitar that isn’t a one-trick pony, but rather has a wide assortment of tonal approaches. Even when played by one-eyed aliens. This allows us to nail the specific guitar sounds needed for doing diverse rock/pop styles and songs. The better we can do this, the better (in the long run) we can land, and keep, that professional tour, or that open door to pro studio sessions. 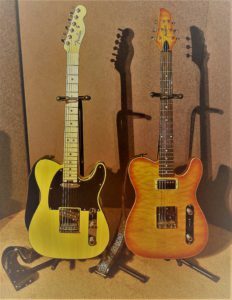 For the recordings, I’m keeping things as simple as possible so that we can concentrate instead on what’s coming out naked from the two Teles. I simply ran a Fender “Vintage Voltage” 1/4″ cable from the Telecaster into my UA Apollo Twin Interface. Then, I fed the signal through only one plug-in: the UA 610B just to raise the gain a little bit, the settings for that you can see on the right. Finally, you can also see that I ran the signal through the “Softube Vintage Amp Room” plug-in so that I could use their cutting-edge modeling techniques to get the amp sound that I thought would grace the Tele sound well. I used the same amp setting, called “Default“, for all songs, except the first recording, on which I used the “Clean” amp setting so you really only hear the guitars. 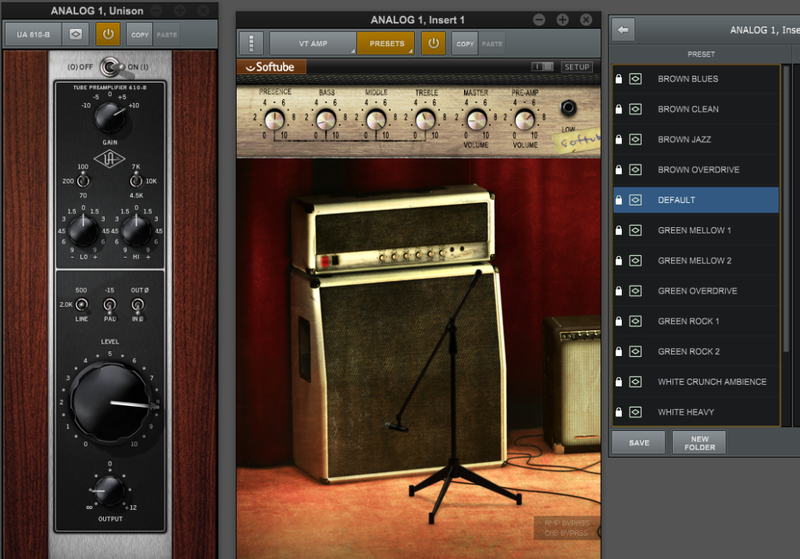 There are only three “classic” amp sounds in this plug-in, and although they don’t say the names, it’s whispered ’round the industry that the three models they offer are a Marshall, a Fender, and a Vox AC30 amp simulation. I believe it, ’cause the controls and features look very much like those original amps. The one you’ll hear on these recordings is the Marshall simulation. I thought it brought the Tele sound to life the best. I then booted up Pro Tools Ultimate, set up my session, and after recording exported the files. There’s no effects, no compression… nada. Just the guitar sounds through the same amp and settings. There’s the Bell! Let the fight begin!! Now that you’ve heard all the options, let’s focus on each one. Well, did that shootout rumble your world like it did me? Were the results what you expected? Were you surprised at any of the results?? The very first thing that shouted out to me in this comparison session concerns the SIGNAL LEVEL. 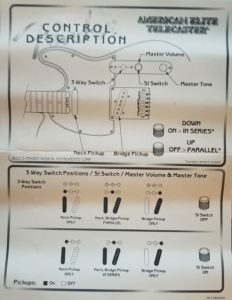 Interestingly, I had to turn UP the Fender Tele in order for it to match the dB level of my Austin at every pickup selection – even the S-1 engaged bridge pickup. In fact, on the first song, I had to boost the 610B preamp level all the way up to 10 just to get the Fender to match my orange beast! And, yes, I DID check, multiple times, to make sure the volume knob was up ALL the way. This was very surprising to me. I never would have expected that my Austin pickups would have so much more dB beef than a real, actual Tele. Whodduh thunk? I’m surmising that it’s because of the “4th generation noiseless pickups” that are now in the Fender. Perhaps the price of clean was a few dB of volume. The second thing I noticed was the NECK THICKNESS of the Fender. It felt a lot bigger to me than the Austin. The phrase that sprung to mind was “baseball bat”. Now, my hands aren’t small, but they’re not huge either, so, again, I was surprised. I got the measuring tape out, wrapped it around the neck, strings on, and measured a 4 and 6/16ths neck thickness on the Austin. The Fender, on the other hand, came in at 4 and a half even. That equates to a neck thickness difference of 2/16s thicker. A difference that is substantial and easily felt upon first playing it. 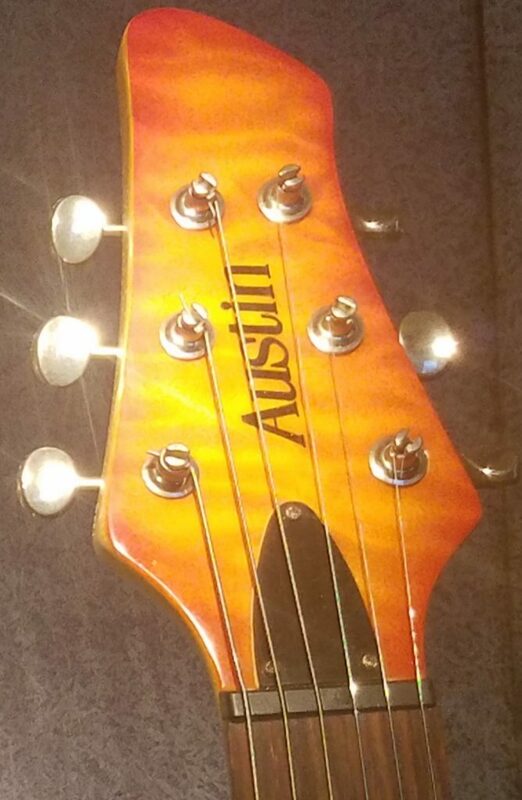 For me, the Austin neck feels “normal” and just right for my playing style. The Tele feels too thick. Your hand mileage may vary, but if you like big, beefy necks, then you’ll probably looooove this Fender neck. The Fender does taper though, from a C shape neck down to a D shape up at the 12th fret. For that reason is was more comfortable while soloing than when doing standard chords in open positions. The third thing I noticed was that the STRAP PEGS on the Fender kept allowing my strap to fall off. I then compared the pegs and saw that my Austin had a more substantial peg, with a bigger spread at the top which kept straps from suddenly surrendering and leaving the party. Not a huge thing, but when I went to play the real Tele and the strap fell off the bottom, I definitely noticed! If I were to keep the Fender, I’d definitely have to get Strap Locks installed. When pickups are wired in series you get higher output & a much fuller tone. That is definitely the case here with the Fender Tele when you engage the S-1 switch. It does make a difference, folks. It ends up sounding more like a Humbucker tonality, and if I were playing this guitar and wanted to cut to a solo… you better believe I’d be pushing that S-1 switch PRONTO, baby! It’s, by far, my favorite sound this Fender Tele makes!! The fifth thing I ran into was not pleasant. 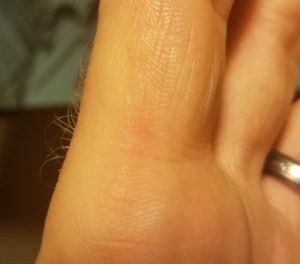 I hadn’t been playing the Tele more than a few hours, when I noticed that I was starting to develop a BLISTER from the edge of the guitar neck! 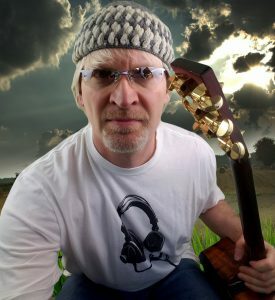 A red, rubbed-raw point in the joint where my first finger meets my palm started to scream for my attention because the edge of the maple fretboard was cutting into my hand there. See the pic to the left. 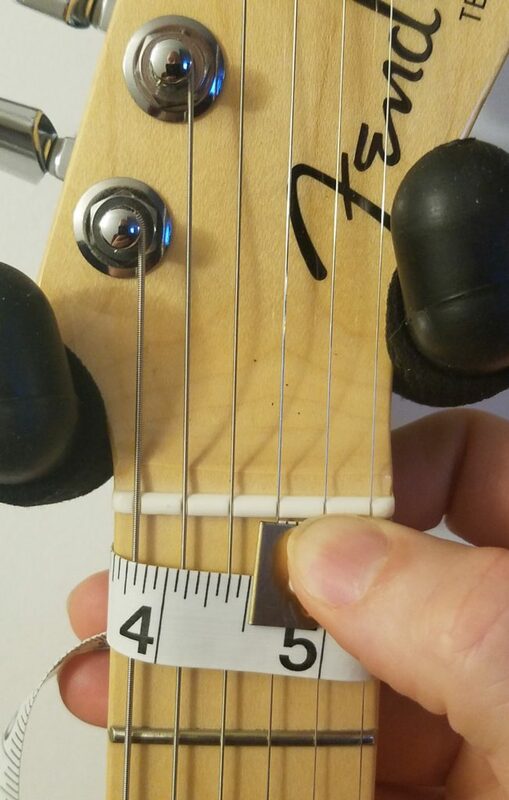 Usually that wouldn’t happen, but because this neck is so thick, my fingers don’t get quite so high up as they do on all my other guitars. Just one more sign that this whoppin’, bulky neck is definitely not for me. I don’t think I need a new guitar callous in yet another spot! This guitar has been extremely useful to me here in the recording studio and live, and this test only proved why. The options choices made in its construction make it a little more versatile than your average Telecaster, and that’s still why I think I like it so much. The Austin really gives me “my” sound. In running it through this test I learned some new things about it that will expand my options even further. First, I never realized just how ACOUSTIC sounding the neck pickup is when the coil tapping is engaged. It’s a sound that the Fender Tele doesn’t have at all, and which I don’t have on any other electric of mine either. Definitely a fresh approach I can now take to some recordings and live numbers – instead of getting my acoustic out, I’ll just use this, for a bit of an unexpected twist! The neck pickup on the Austin is a humbucker, and it stood out as the biggest difference maker between the two instruments. Yes, it indeed does sound more “Les Paul”-like, as you could probably guess. Fender did have this same approach back in ’62, which this Austin is modeled after, but not everybody is going to want that much of a change of tone on their Tele. If you DO like a wider tonal spectrum though, the Austin answers those G.A.S.-y prayers without a downbeat hesitation! This test also helped me see that the Austin does not have as much of the high, treble cut as the Fender does in the neck and mid positions. The bridge pickup, however, sounds cut from the same cloth, so when I need the Tele twang I have it in one setting. Lastly, I was glad to hear that the Austin did not produce a lot more noise than the Fender. Since the Fender pickups are heavily marketed as “4th generation noiseless pickups”, I figured that would be where I’d hear a big difference. But nope, not so much. Only in the bridge pickup setting did I hear noise, and that only occurred if was (as expected) not touching the strings. Because I engage a noise gate when I play electric typically, it’s a non-issue. In the final analysis, the Austin has a more diverse, versatile pickup sound set, while the Fender concentrates on that spanky treble twang, no matter which pickup configuration you choose. If I were playing a ton of Nashville country, there’s no doubt the Fender would be a great asset. I would, however, have to have a totally different neck than what this Elite provides, because it’s just too much of a baseball bat for what I’m used to. They’re both good instruments, though each fills a different niche gives you different options, depending on your stylistic and tonal needs. And money? How ’bout that price thang? Is the Fender worth the $1,700 more I spent to buy it, over my Austin?? I was going to keep the Tele too, if it really brought sounds to the mixing table that I couldn’t get elsewhere, but, at its extreme price point, and with the Austin already giving me the Tele smack I want at times… I think I’ll be heading back to the store today with some bad news. This comparison is only looking at one type of guitar and sound, and thus really only scratches the surface of our brand vs. knock-off topic. To gain even more understanding, we must all start to do research about the audio equipment we want and need, and then share what we find with others. As you do, share your findings with us here at Seriousgas. It’s part of what makes this community fun, interesting, but also informative. These tests, as you can see above, really shed practical light onto what gear can really do… and not do. Who makes the best type? What does “best” even mean with regard to this instrument/piece of gear? What company has the best/ the longest return policy? 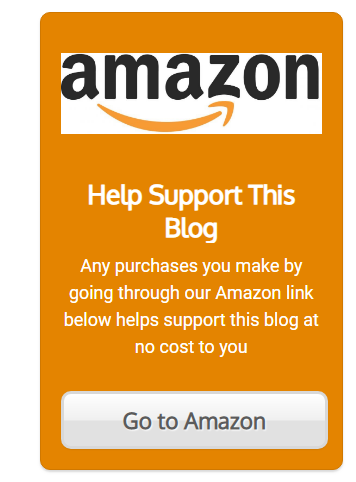 Is there any reason not to simply and easily buy it online?? Which do I simply like best?? Why?? Is this a very specified tool, amazing for one thing? Or is it a tool for versatility, able to perform many tasks?? How does it feel to use?? If we ask these questions, research and get the answers, we can all help each other maximize the potential of, not only our gear, but our income! So I hope today’s shootout uncovered some coveted kernels of truth about expensive and inexpensive guitars for you. My biggest takeaway is that… they’re not always all that different. This was obviously no drive-by shooting either; it tooks quite a few days of prep, organizing, writing, recording and re-writing to get here, but I’m so glad to do it. The results speak for themselves. Whichever Tele sound you like best, just know that there’s usually a good option at most price points to keep your tone-chasing heart happy. And that’s always a quest worth pursuing. His new band – “Jack & the Telecasters”!